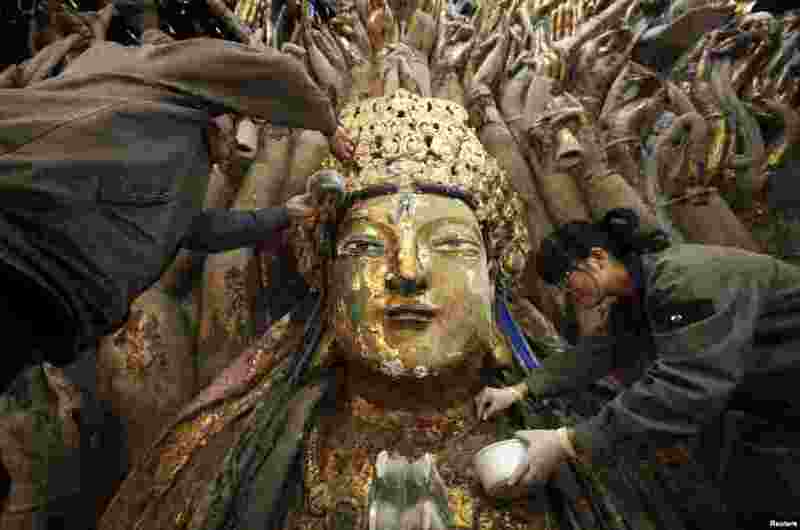 ۱ Restoration workers peel off loose gold foil as part of a restoration project for an 800-year-old Thousand-Hand Guanyin Buddhist statue on Mount Baoding in Chongqing municipality, China. The stone-carving statue, which takes up about 88 square metres on the mountain, dates back to the Southern Song Dynasty (1127-1279). 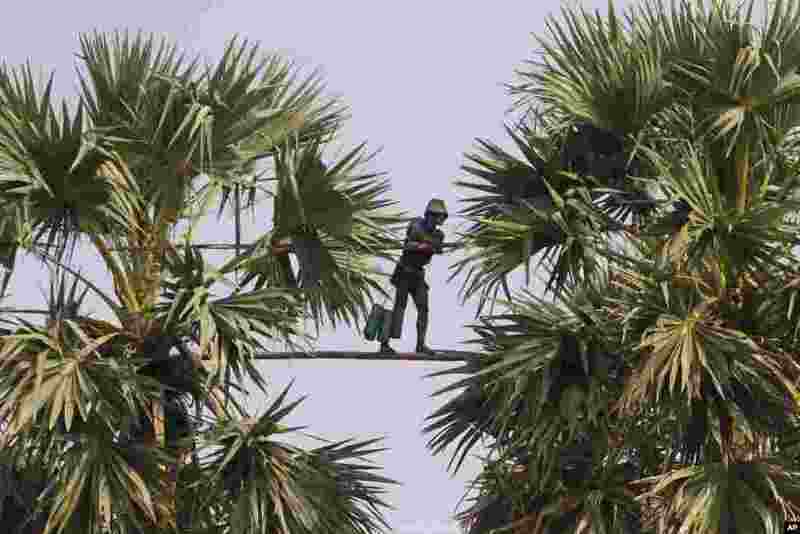 ۲ A Cambodian man walks on a 5 meters (16.5 feet) long bamboo pole spanning across two tall palm trees as he collects palm juice to make palm sugar during its harvest season in Samroang village, Kampong Chhnang province, northwst of Phnom Penh. 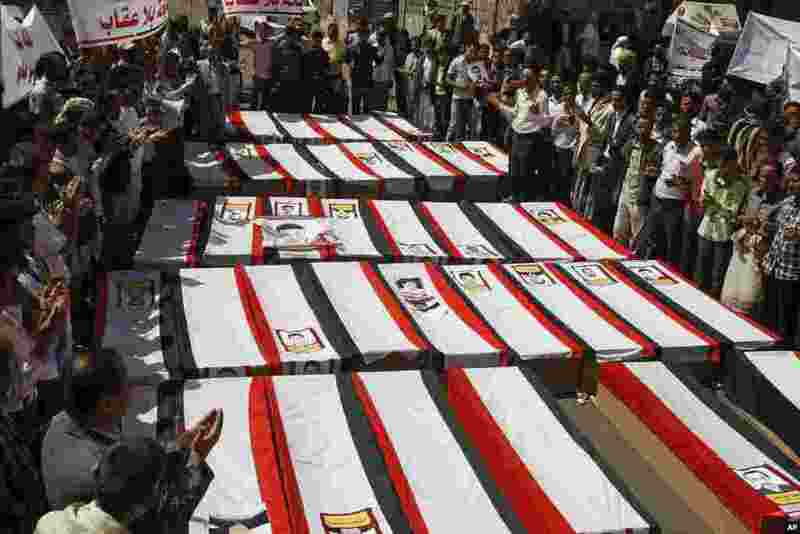 ۳ Yemeni pro-democracy protesters chant prayers as they stand around mock coffins to commemorate those who were killed on March 18, 2011, during a rally against the rule of the country's former President Saleh in Sana'a. 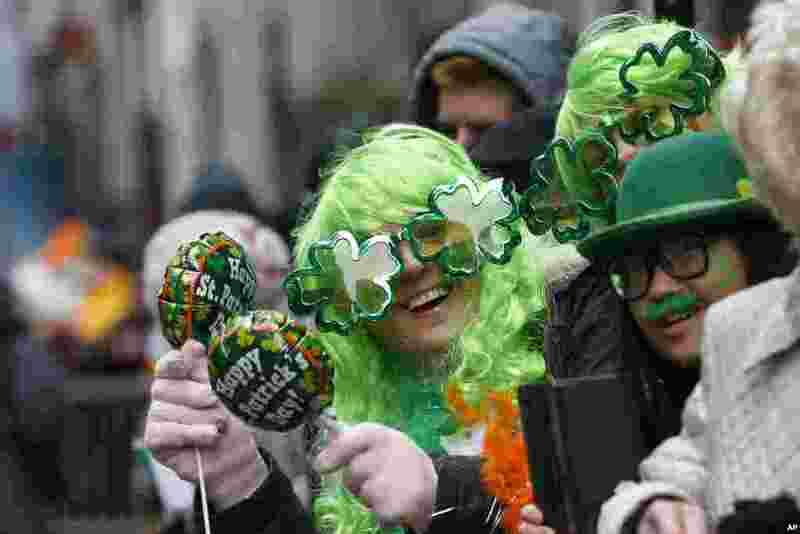 ۴ People stand along 5th Avenue during the St. Patrick's Day parade in New York, Mar. 17, 2014. 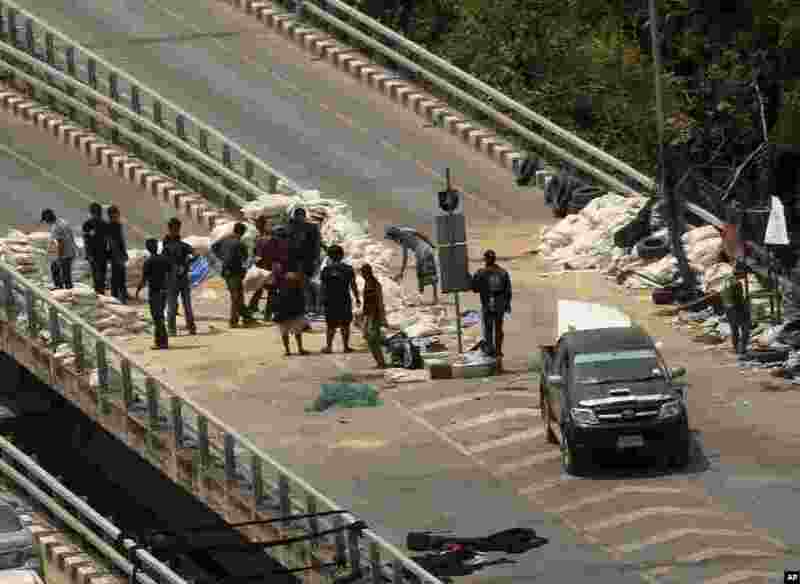 ۵ Anti-government protesters dismantle the sandbag barriers, blocking the overfly on the street near their protesting site of Lumpino park in Bangkok, Thailand's government is lifting a state of emergency in Bangkok and surrounding areas after violence related to the country’s political crisis eased. 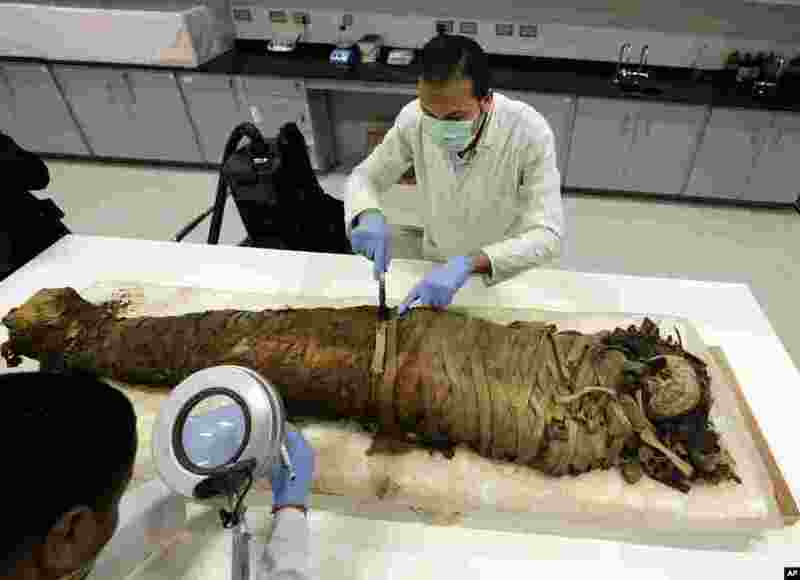 ۶ Egyptian conservators clean a female mummy dated to Pharaonic late period (712-323 BC) in the conservation center of Egypt's Grand museum under construction, just outside Cairo, Mar. 17, 2014. 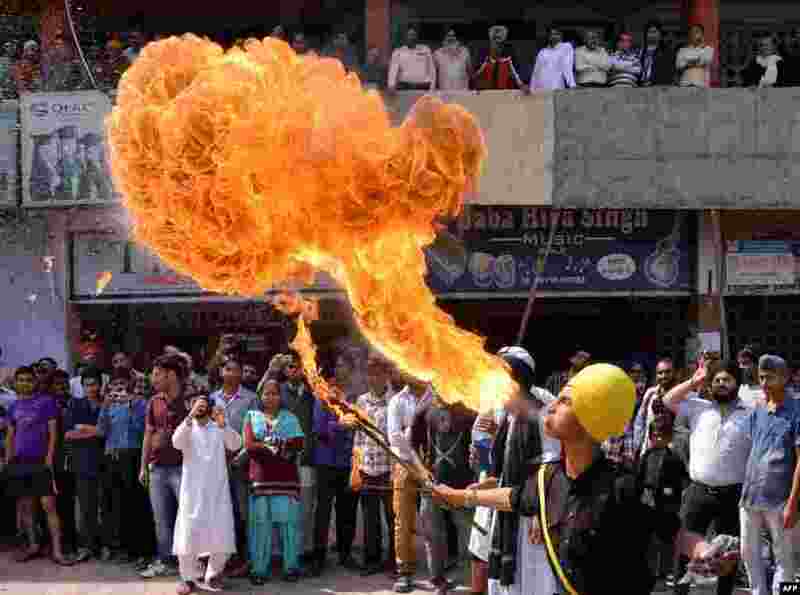 ۷ Indian Sikh youths perform fire-breathing as they demonstrate Gatka martial arts skills while welcoming unseen Bharatiya Janata Party (BJP) senior leader and candidate for Amritsar's parliamentary seat Arun Jaitley to an event in Amritsar. 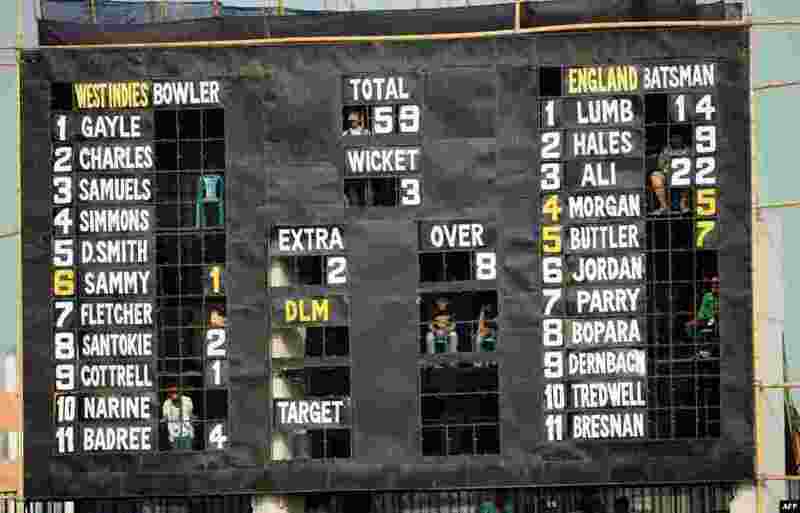 ۸ Bangladesh spectators sit inside a scoreboard as they watch the ICC World Twenty20 cricket tournament warm-up match between England and the West Indies at the Khan Shaheb Osman Ali Stadium in Fatullah on the outskirts of Dhaka.